The suite of Alexa Helper SmartApps are add-ins to the SmartThings mobile application that allows you to control a broad array of devices with your Amazon Echo. The Echo (“Alexa” as sometimes referred to) already has control over switches and dimmers within the SmartThings environment; however, it cannot natively control other SmartThings devices such as locks, speakers or thermostats. In addition, there is no way to natively trigger SmartThings modes, routines or security states using the Echo. With the Alexa Helper Suite, a simple voice command can set your thermostat, lock your doors, or trigger a complex routine of events. Alexa Helper brings voice control to even more of your smart home. In addition, you will have the ability to control devices at multiple locations, a function not even the SmartThings infrastructure easily allows. Alexa Helper and your other smart devices While functionality is built into the native Amazon Echo mobile application, Alexa Helper allows you to set up a sequence of lights to turn on or off depending on what command is given. In addition, Alexa Helper can set up colored lights, lock/unlock doors, and open/close garage doors. For items such as locks, you are limited by the context of what the Echo can understand; in other words, you might be limited to saying <"Alexa, turn on DoorUnlock"> instead of <"Alexa, unlock front door">. However, "open" and "close" are undocumented commands for the Echo and can be used with items like garage doors (i.e. <"Alexa, open GarageDoor">). Alexa Helper and your thermostat: While thermostats can be naively controlled (As of 3/3/16) with the Echo, Alexa Helper allows you to expand your control by not only allowing you to set the temperature of your smart thermostat with simple, intuitive voice commands, but also control your thermostate modes (heating, cooling, or auto). Alexa Helper can only control thermostats that are already integrated into SmartThings. Alexa Helper and your baseboard heaters: Alexa Helper allows you to control the temperature setpoints of your smart baseboard heaters with simple, intuitive voice commands. 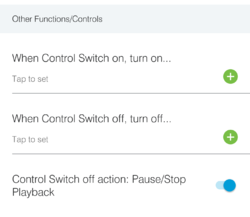 While this functionality is part of the native SmartThings integration, you can also set up consistent set points that allow the simple command <"Alexa, turn on heat">. Alexa Helper and your speakers:	With Alexa Helper, you can turn your smart speakers' music on or and off with voice commands to your Amazon Echo. You can also adjust the volume, as well as skipping forward or backward in your preset playlist. Alexa Helper does not currently allow your Amazon Echo to choose a specific song from your playlist (unless you have a Sonos speaker system). And just like the thermostats, Alexa Helper can only control speakers that are already integrated into and operational with SmartThings. You may also summon voice reports through your connected speakers. 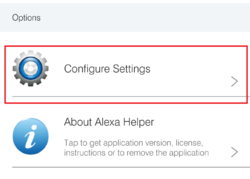 Alexa Helper and modes/routines:	Using Alexa Helper with your Amazon Echo, you can initiate any mode or routine you have previously created using SmartThings. Alexa Helper and Smart Home Monitor: Alexa Helper allows you change the state of the Smart Home Monitor. Used in combination with the scenario delays, a user can set a count down before their security system arms, ensuring enough time to leave the house. Alexa Helper and other locations: Alexa Helper allows you to send commands to smart products in multiple locations, whether in different floors of a building, or in separate homes in different locales. Throughout this document there will be some specific terms relating to the SmartThings and Amazon environments. SmartApp: Add-in to the SmartThings mobile application that allows for functionality outside of what is provided by default. These SmartApps are not stand alone programs, but only operate within the SmartThings mobile application. SmartApps are open source and written in a form of the Java programming language called “groovy”. Parent/Child SmartApp: A code structure within the SmartThings development environment where a single instance of a parent SmartApp can have multiple child SmartApps associated with it, allowing the single SmartApp to have multiple functions. Alexa Helper uses this structure; there can only be one instance of the Alexa Helper Parent SmartApp and each scenario created within the parent SmartApp is actually an instance of the child SmartApp. This structure cuts down on repeated code within a single SmartApp. Virtual Switch: A device within the SmartThings environment that functions like a regular switch (think of a button or a light switch). However, the device is “virtual” and does not exist as a physical device. While there are various types of virtual switches, two types of virtual switches will be mentioned when using Alexa Helper: an virtual on/off dimmer called an "Alexa Switch" and a Momentary Button Tile. Alexa Switch: A custom type of virtual switch that acts as both a normal on/off switch and as a dimmer. This type of switch can be toggled “on” or “off” and can also be set to different levels (0 to 100) of “brightness”. This type of device is useful for controlling scenarios that need distinct "on" or "off" control along with the volume of a speaker or setting different temperatures on a thermostat. This switch also sends on or off commands regardless of its state; in other words, if it is on and you tell it to turn on, it will still react within Alexa Helper as if it was off turning to on. This allows Alexa Helper to maintain control of devices regardless if they are interacted with manually or through other automation. Momentary Button Tile: A type of virtual switch that behaves like a spring-loaded physical switch (think of a doorbell button). In other words, the switch is normally in a closed ("off") state and when pressed, it will toggle from the default state to the opposite state, and then reset again (off->on->off). This type of device is good for items that just need a trigger, such as changing modes or routines. Please note that when using a momentary button tile with the Echo, whether you command it to turn "on" or "off", the result will be the same: it will send the same "push" command and the switch itself will then reset to the "off" state. IDE: Abbreviation for “Integrated Development Environment”. In the context of the SmartThings environment, this is the web site located at http://ide.smartthings.com or https://graph-eu01-euwest1.api.smartthings.com/ (depending on your country) that allows for advanced functionality within the SmartThings environment. This allows you to set up custom devices and applications that appear within your SmartThings mobile application. GitHub: A web-based repository that allows for distribution revision control and source code management functionality. OAuth: Provides client applications a secure method for accessing resources on behalf of the resource owner. Within the context of SmartThings, certain custom applications that allow for remote access (such as remotely turning on or off a light) will require additional authentication. As the owner of the resource, you can authorize remote access to an application by enabling OAuth. Access Token: A security identity that is linked to OAuth and in the context of SmartThings allows for remote control of a locations devices. The setup of your Amazon Echo is outside the scope of this document. Please refer to your Amazon Echo documentation, use the Amazon Echo mobile app, or visit http://alexa.amazon.com to set up your device. Within the Amazon Echo Application (NOT the SmartThings app), or http://alexa.amazon.com, you should now see the switches you have "Discovered"
Alexa Helper will only function if all of the steps above have been followed. While there are a total of five components mentioned in this manual for use of Alexa Helper, only the Parent and Child(scenario) apps are required for basic functionality. If you need to control a speaker's volume or change the temperature of a thermostat, you will also install the Alexa Switch code. This switch can also be used where distinct "on" or "off" conditions are needed. If you want to issue a simple command button (i.e. change speaker track), a momentary button tile is required, so you will want to install that type of device (instructions are here: Alexa Helper#Momentary Button Tile Installation). Finally, if you desire to generate URLs for use in Alexa Helper, you will also need the Cloud Interface code as well. 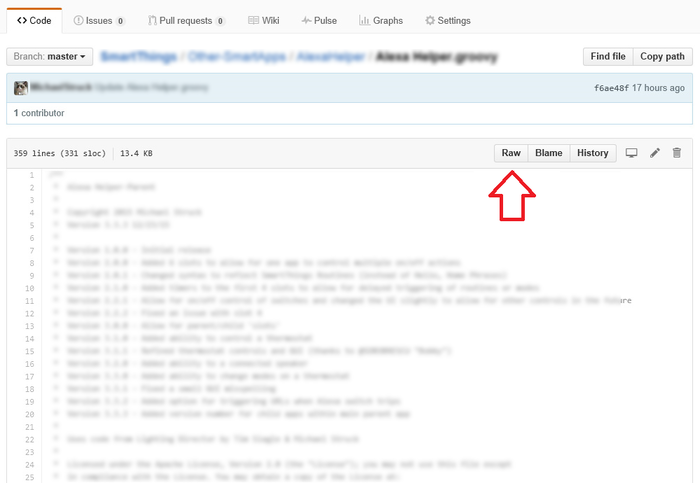 While on the GitHub site, find the Raw button and click it. This will bring up a non-formatted page with just the code present. Select all of the code (typically CTRL+A) and copy It (typically CTRL+C). Next, point your browser to you SmartThings IDE (http://ide.smartthings.com or https://graph-eu01-euwest1.api.smartthings.com depending on your country) and Log In. DO NOT publish this code. The child apps must not be published, as they should only be accessed via the main (parent) app. Before leaving this page, make sure that you enable OAuth for this particular SmartApp. This OAuth allows for secure remote access of the SmartThings devices. Clicking the OAuth link will reveal a button labeled Enable OAuth in Smart App. Click this button. The screen will change, giving you a unique code for your Client ID and Client Secret. These are the foundations of the security of your app and should be kept secret. You do not need to memorize or write down these codes; nor do you need to add any other information to this page. OAuth simply needs to be enabled for Cloud Interface to generate your unique URLs. The final step is to press the Update button at the bottom left corner of the screen, or go back to your code by using the button in the upper-right region of the page, then Save, then Publish the SmartApp again. Click the Execute Update in the bottom-right corner of the screen. When done syncing, the new apps should now appear in your IDE. If they ever change color, that indicates a new version is available. 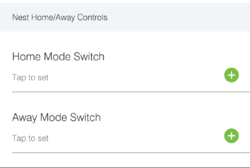 Virtual switches allow for better control of your SmartThings environment than using the physical switches in your house. This allows a non-physical switch to be “tripped” to make other events happens, some of which the Amazon Echo cannot perform natively. This includes changing security modes, or running SmartThings routines, which can include a lot of functions that need to happen at the same time. For example, having a virtual switch named “Night Mode” can be tied to a “Good Night” Routine, which could shut off the lights, lock the door, turn off the heat, set the mode to “Asleep”, and set the Smart Home Monitor to “Armed:Stay” - all by merely saying, <”Alexa, turn on Night Mode”>. 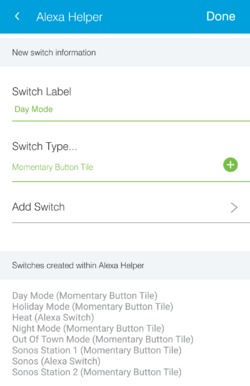 The two virtual switches recommended to use with Alexa Helper are the Momentary Button Tiles and "Alexa Switches"; while momentary button tiles are native to SmartThings, included here are instructions to set up a special version of the momentary button tile that can be added directly from the Alexa Helper SmartApp. The "Alexa Switches" are not present by default in the SmartThings environment; you must gain access to the SmartThings Developer IDE to create this type of switch. However, the process for adding these to your SmartThings account is rather simple. No matter what virtual switch you choose to use, once you've created them, be sure to "Discover" the virtual switches within the Amazon Echo App. This is a required step to link the switches with Alexa Helper. Just like adding the code for the Alexa Helper SmartApp, go to the IDE and log in. Next, find the section labeled My Devices. Click this link. 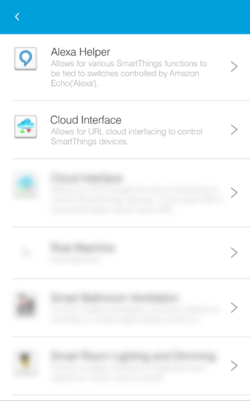 On this next page, you will be presented a list of all of the devices within your SmartThings account. You should see all the physical devices on your account. From here, find the button in the upper-right corner of the page labeled +New Device. Click this link and you will be presented with a number of fields to fill in. Starting at the top of the fields, fill out the name of the device. You may want to create a sort of naming convention with starting everything with a "v" such as "vThermostat". However, if you plan to use these names with Alexa you should use a name that Alexa can recognize (Like “Night Mode”, “Day Mode”, etc.). 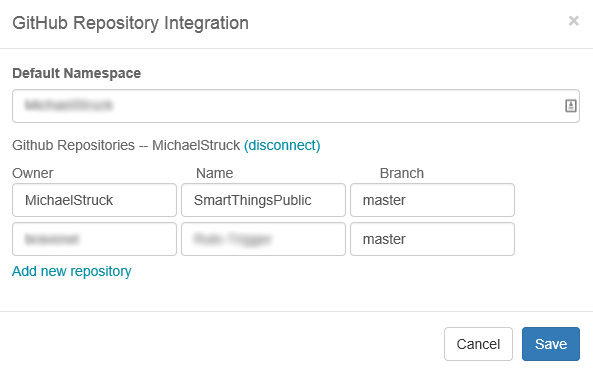 You can always rename it later within the SmartThings mobile application or the IDE. Once you fill out the name, simply use the same name for the Label as well. 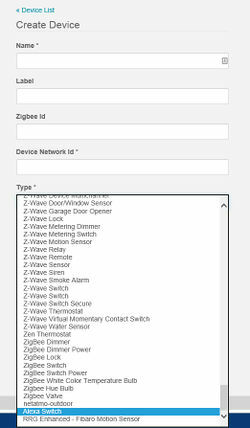 Since this is a virtual device, leave the Zigbee Id field blank. For the field labeled Device Network Id, fill in a number that is unique to your environment (you may need to look at the list from the previous screen to determine what is unique.) This field is required, however, the number is not used anywhere else, so a simple “1234567890” could work well for this. Any subsequent devices created could build off of this (for example: “223456790”). The field is alphanumeric, so you might choose to use the Device Name you've used above, but without any spaces. In the next field labeled Type, choose “Momentary Button Tile” for a "push-type" virtual device. The Version field should remain as “Published”, and both the Location and Hub should have your location’s hub listed. Ensure both of these fields are not empty. Group, however, can remain empty. When you are happy with your entries, click the Create button. You will be taken back to the My Devices page, which should now include your newly created virtual switch. 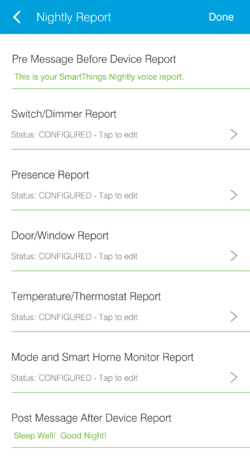 You can always click on the switch again and edit it should you need to, or you can edit some of the attributes (such as the name) in the SmartThings mobile application on your phone or tablet. Finally, you should include this newly added switch to the Alexa Echo App and "Discover" it via the Echo or the Amazon Echo App, thus ensuring that voice commands have access to the switch. Setting up an Alexa Switch is slightly different than setting up a Momentary Button Tile. Momentary Button Tiles are native to SmartThings; an Alexa Switch is not. However, code is provided as part of the Alexa Helper suite that will allow you to create an Alexa Switch as easily as the other virtual switches. The first part of these instructions are required whether you choose to add your switches via the IDE or the Alexa Helper application. If you will be creating your virtual switches via Alexa Helper, once the code is loaded proceed to Alexa_Helper#In_App_Virtual_Switch_Creation for instructions to add the switches via Alexa Helper. Just as with the code for the SmartApps, be sure to click the Raw link, and then select all of the code (typically CTRL+A), and then copy it (typically CTRL+C) to your computer’s clipboard. Then, go to the SmartThings IDE at http://ide.smartthings.com. Log into the site and click the link at the top labeled My Device Types. This will present you with a list of custom device types that you may have within your account. If you do not yet have an Alexa Switch listed, click the link +New Device Type in the upper right-hand corner of the screen. There will be three tabs at the top; these represent the different ways to add a device. Choose From Code and you will be presented with an empty area where the code you copied earlier can be placed. In the open area in the middle paste (typically CTRL+V) this code. From here, simply click Save and then click Publish (For Me), exactly as you did when creating the SmartApps. the code only needs to be installed in this manner once. The remaining steps for creating an Alexa Switch are the same as the momentary button tiles within the IDE. 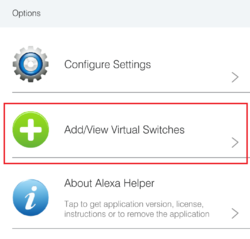 If you choose to create your virtual switches via the Alexa Helper SmartApp, please proceed to the instructions in this section Alexa_Helper#In_App_Virtual_Switch_Creation. 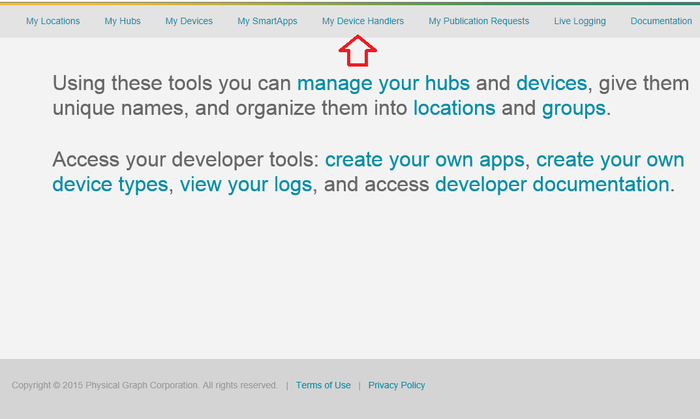 Find the section labeled My Devices at the top of http://ide.smartthings.com. Click this link. Find the button in the upper right corner of the page labeled +New Device. Click this link. Fill out the fields as you did for the virtual switch, being mindful of what you use for the Name/Label if you plan to speak it to the Amazon Echo. For the field labeled Device Network Id, ensure the ID you choose is unique in your SmartThings environment. In the field labeled 'Type,' use the pull down button and scroll to the bottom of the list where you will find a new device called “Alexa Switch”. Choose this device type. If this device does not appear in the list, go back to the code installation section above to ensure you published the code properly. The Version field should read “Published”. Both the Location and Hub should have your location’s hub listed. Group can rem ain empty. 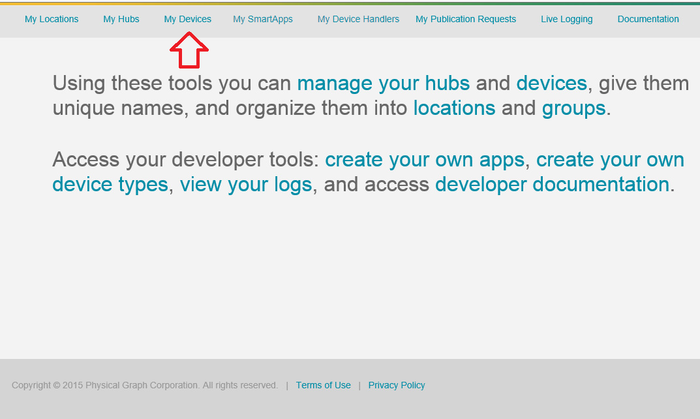 You will be taken back to the My Devices page, which should now include your newly created Alexa Switch. Be sure to discover the new switch within the Amazon Echo app. While it is perfectly acceptable to create virtual switches via the IDE, this is rather inconvenient when you are away from a computer. Instead, Alexa Helper gives you the ability to create virtual switches within the SmartApp directly. Be sure to click the Raw link, and then select all of the code (typically CTRL+A), and then copy it (typically CTRL+C) to your computer’s clipboard. 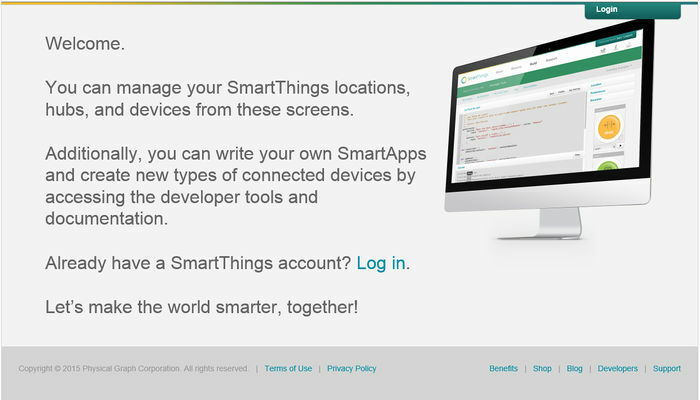 Go to the SmartThings IDE at http://ide.smartthings.com. Log into the site and click the link at the top labeled My Device Types. Click the link +New Device Type in the upper right-hand corner of the screen. Choose From Code and you will be presented with an empty area where the code you copied earlier can be placed. In the open area in the middle paste (typically CTRL+V) this code. Click Save and then click Publish (For Me). From here, you may exclusively use the Alexa Helper SmartApp to create your virtual switches. To do this, first you must enable the ability to create switches within the SmartApp. Please see Alexa_Helper#Settings for these instructions. Next, on the main Alexa Helper screen find the <<View/Add Virtual Switches>> under the <<Options>> section. Tapping the <<View/Add Virtual Switches>> area, you will be taken to a new page where you can not only see the switches you have created in the SmartApp, but also allows you to create new switches. To create a new switch, enter the name of the switch in the <<Switch Label>> area. Please note the label is typically how you address the device when speaking commands to the Amazon Echo. Be sure to choose a unique name. Next, you will need to choose the type of switch you would like to create from the <<Switch Type...>> area. Currently, your choices are either an Alexa Switch or a momentary button tile. The difference in these switches is explained here: Alexa_Helper#Definitions. When you enter the above information, the <<Add switch>> option will appear. Tapping this area should create your virtual switch. If there were any errors in creating the switch they will be listed on the screen. The most typical error is that you have not loaded the code properly in the above steps. Ensure the switch code is saved and published properly. 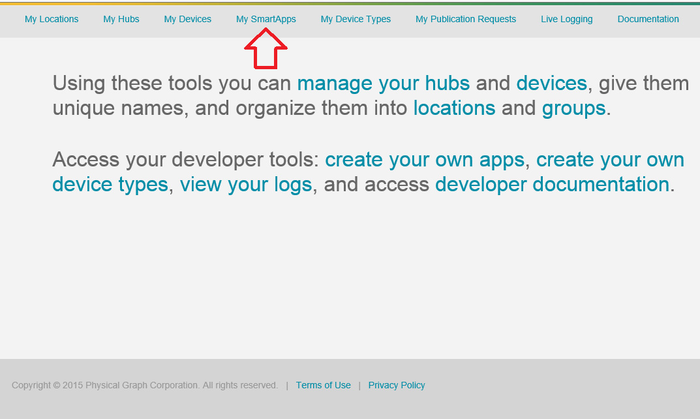 If you installed the code properly, you should find the Alexa Helper (and Cloud Interface if you chose to install it) SmartApp located in the SmartThings Mobile Application under Market Place>>>SmartApps>>>+MyApps. If you just need to control lights, routines, modes, etc. simply install the Alexa Helper SmartApp. If you require more advanced functionality, install the Cloud Interface SmartApp. Refer to Alexa Helper#Cloud Interface Smart App Setup for installation of this SmartApp. If the Alexa Helper-Scenario SmartApp shows up in the list, it means you inadvertently published it. To solve this, you must delete the publication, which requires deleting and re-adding the code. To do this, go back to My SmartApps page on the IDE and choose the edit button ( ) for Alexa Helper-Scenario, select all of the code (CTRL+A) and copy it (CTRL+C). Then, click the App Settings link. On this page, delete the code. Then, follow the process to create a new SmartApp, ensuring when you are done that you DO NOT publish the code…only save it. Returning to Market Place>>SmartApps>>>+MyApps should now show just show the parent app and the cloud interface (if you chose to install it). Click the SmartApp you would like to install. This will open the application for setup. If you encounter any error at this point, ensure you have the scenario (child) code installed, but not published. When you first open Alexa Helper you will be presented with the main screen which allows you to create a new scenario, configure your settings, or view the About/Help screen. Depending on your use case, you may need to change the settings to accommodate some of the specialized hardware supported by Alexa Helper, or help reduce the options within the scenarios for functions you do not use, or to utilize the notification feed on the SmartThings mobile app. To do this, find the option toward the bottom of the main Alexa Helper screen labeled <<Configure Settings>>. You will be presented with various options on this page. If you have Sonos speakers and want to set up saved stations, you would turn on the switch labeled <<Show Sonos options>>. Choosing this option will also reveal the <<Maximum number of Sonos memory slots>> where you can define 2 to 8 memory slots. In addition, if you have a Nest Thermostat and use the community-provided device code, clicking the <<Show Nest options>> will allow you to set up momentary button tiles to turn on Home or Away modes (which are specific to Nest Thermostats). If you have no need to set up restrictions on the Alexa Helper scenarios, you could turn off the <<Show scenario restrictions>> option to eliminated the restrictions shown on the scenario setup. set up special functionality using the restrictions (see Alexa Helper#Tips and Tricks). If you turn this option off, all restrictions previously set up will ignored. By clicking the <<Allow in-app virtual switch creation>> you can enable the function that allows you to create either a Momentary Button Tile or Alexa Switch directly from Alexa Helper instead of using the SmartThings IDE. Toggling the <<Post activity to notification feed>> allows you to have more verbose messages sent to the SmartThings notification feed. This includes sending messages about what scenario was triggered, or if a message was sent via SMS. When this screen first appears, you are presented with a few options: you can enter the scenario name, choose its type, or you can remove this scenario. To begin creating the Control scenario, enter the name you would like to give it. This is the name that will appear in the main Alexa Helper screen. 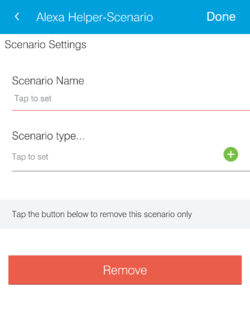 Next, tap <<Scenario Type>> and choose from one of the available types. In this case, we will choose the one called <<Modes/Routines/Switches/HTTP/SHM>>. Selecting a <<Scenario Type>> will present new options on the screen, including setting up scenario switch and restrictions (if enabled). To set up a switch with the SmartApp, please follow the directions here: Alexa_Helper#In_App_Scenario_Switch_Creation. The restrictions are set of conditions that must be met for scenario to trigger, including the day of the week, during a certain time, or in certain modes. See Alexa Helper#Tips and Tricks for more information on how to use restrictions. To begin configuring the other aspects of the scenario, find the settings area below the <<Scenario Type>>. Tap this area to configure the settings for the Modes/Routines/Devices/HTTP/SHM ("Control Scenario"). The <<Control Switch>> is recognized by the Echo and its on/off states can control various aspects of this scenario. It is recommended you use an Alexa Switch (on/off) or a momentary button tile as a control switch. If the switch you choose is a momentary button tile, you may want to hide certain functions of the switch state. For example, if you are using a momentary button tile, you would probably not want to set any of the "off" options of the switch as it would only go into that state immediately after being turned "on". However, since a momentary button tile will react to "on" or "off" commands, it might be easier from a verbal perspective to hide the "on" options if the verbal command will be to turn off some items(for example <"Alexa, turn off Day Mode">. To give the most amount of flexibility you have the option of configuring which switch states are reacted to by choosing <<Switch states to react to...>>. Depending on the setting of <<Switch states to react to...>>, you will have either "On" options shown only, the "Off" options only, or both shown. The only difference is the switch option, which will follow the command given to the Echo (on or off). If you are using a momentary button tile as the control switch and set <<Switch states to react to...>> as "Off" the options you will see will be used when the switch toggles from on to off and then back to on. However, you can still use a momentary button tile and have the "on" options operate, as the switch has both states when it is toggled. For the options in this section, choose the routine, mode, Smart Home Monitor status you want to have enabled when the Alexa switch chosen is turned on. You also have the option of turn on/off (or toggle) certain devices such as switches, dimmers and colored light even though this functionality is present in the native Amazon Echo mobile application. However, unlike native functionality, you can set the dimmer to an initial value when turned on, or choose the color of the colored light. In addition, you have the ability to set the lock/unlock status of a door lock, or even open/close a garage door. In fact, using an Alexa Switch (see Alexa Helper#Alexa Switch Installation), you can use the commands <"Alexa, open GarageDoor"> or <"Alexa, close GarargeDoor"> to open and close the garage door. The open/close functions are undocumented feature that turns on/off switches. There is also an option to run an <<HTTP request...>> when the Alexa Switch is turned on. This is for advanced users and sends an HTTP GET request (External to your LAN or Internet facing) upon the Alexa Switch being triggered. 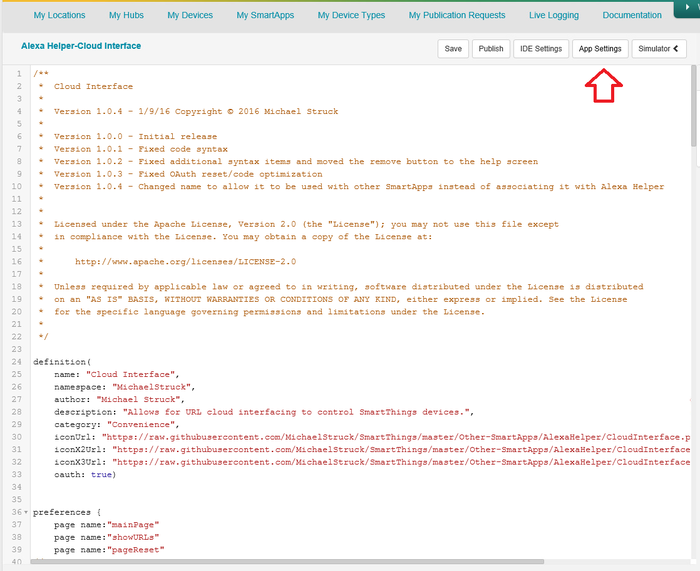 If you wish to use this option with a SmartThings location, you may also install the Cloud Interface SmartApp (see Alexa Helper#Cloud Interface Code Installation and Alexa Helper#Cloud Interface Smart App Setup). This functionality may also be used with the IFTTT web site. 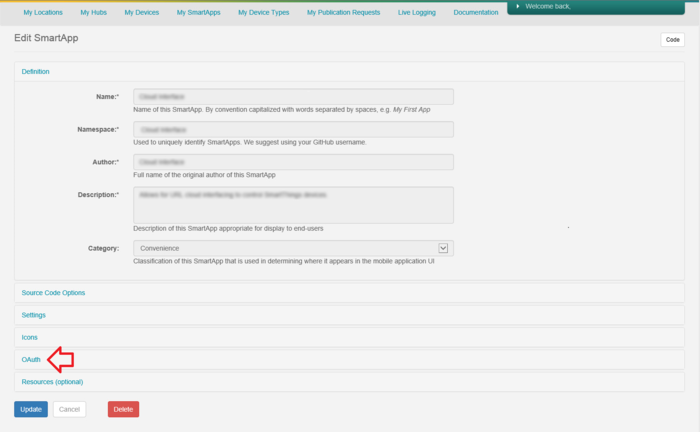 On the HTTP configuration page, you will also be presented with other advanced options such as specifying an IP, port and command for LAN (internal) connected devices. Near the bottom of the page, you have the option to set a delay (in minutes) of when you want the actions to take place after you issue a voice command. For example, if you want to enable the security after 5 minutes of saying <"Alexa, turn on security mode">, you would set this to 5 and after that many minutes your actions under this section would actually fire. Finally, at the bottom of the on or off section, you are given the option to have an SMS message or push message sent when the scenario is triggered. This could be useful in situations where you delay the triggering of the scenario though the delay option above. If you wish to send the message via SMS text, both the phone number and message must be present. If you just want a push message to be sent, tap the slider to the right and ensure there is a message present to display. When you have completed configuring the settings, tap <<Done>> at the top of the page. This will give you one more opportunity to change the scenario name or modify your restrictions. When you are completely satisfied with all of your settings within the scenario, click <<Done>> again to return to the Alexa Helper main interface. While the Amazon Echo has no ability to natively make phone calls or sound alarms, Alexa Helper can give you the ability to set up a key word (the name of the momentary button tile) and when you turn the switch on (i.e. 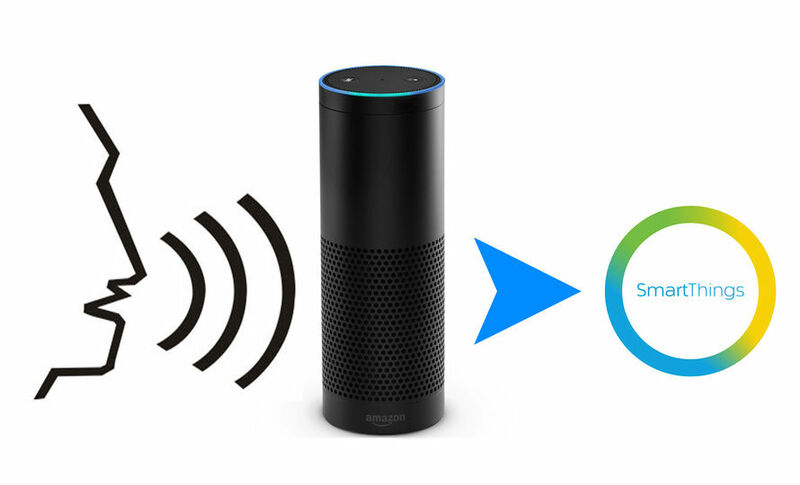 <"Alexa, turn on PanicMode">) you can have your SmartThings connected alarm engage the siren, the strobe light, or both. In addition, if configured, you can SMS text a short, predefined message to a phone number or push message. 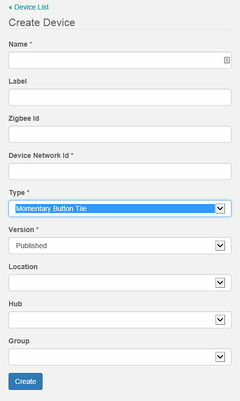 To set up this functionality, first create a momentary button tile that is strategically named (see Alexa Helper#Momentary Button Tile Installation). For example, it could be something like "PanicMode", but if it is a truly dangerous situation, maybe something like "CallPolice" would be more useful. It is also recommended (and by design) that you also create a second momentary button tile to turn off the alarm (or send an "all clear" SMS/push message). Using a worst case scenario where you are in a dangerous situation, a clever home intruder might try to turn off the alarm by saying the off command to the same switch name; having a second, more obscure off command would allow the alarm to continue to sound. Once you have your momentary button tiles set up, and just like in other scenarios set ups, start with creating a scenario here: Alexa Helper#Scenario Name/Type screen. Enter a Scenario Name and when choosing the scenario type choose <<Panic Commands>>. 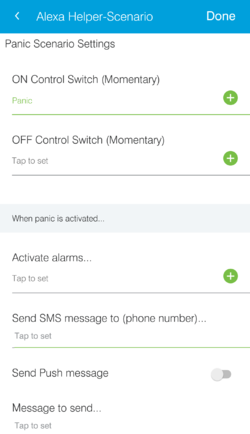 Tap the area labeled <<Panic Scenario Settings>>. Input the switches you created in the respective areas. If you choose not to set up an off command, or if there is a need to only sound the alarm for a predesignated amount of time, you can scroll down on the page and set a duration the alarm will sound. Please note the timer only turns off the alarm; SMS or push messages are not automatically set unless you set up a specific "Off" command. Just like the command scenario, when you have finished setting up the options on this page, tap <<Done>> at the top of the page. This will bring you back to the main scenario configuration page. From here, click <<Done>> again to return to the Alexa Helper main interface. to both commands. Alexa Helper can not change this behavior currently. Please be aware of this limitation when setting up the panic command. 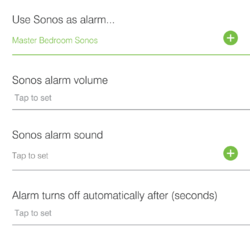 If you have Sonos speakers connected to your SmartThings environment, and the <<Show Sonos options>> is turned on (via the main Alexa Helper <<Settings>> page), you will see the option to use these speakers as an alarm siren. Simply set the speaker you want to use, the volume level of the alarm, the type of alarm you want to use and the duration of the sound clip. There are 4 pre-installed alarms sounds included, and a fifth that allows for a custom sound. It is recommend you use a sound length of at least 60 seconds. Natively, the Amazon Echo can control thermostats. This functionality is also available via Alexa Helper with an Alexa Switch. However, Alexa Helper expands you control over your thermostat, allowing you to use momentary button tiles to turn on different modes of the thermostat such as heating, cooling and auto. To set up this thermostat functionality, from the main Alexa Helper screen choose <<Create New Alexa Scenario…>>. You will be brought to the Scenario Name/Type screen. Enter a Scenario Name. When choosing the scenario type choose <<Heating/Cooling Thermostat>>. Once chosen, click the field below the <<Scenario Type>> to enter the thermostat settings. At the top of the screen, choose a <<Control Switch>> to use as the thermostat control. It is recommended you use an Alexa Switch (see Alexa Helper#Alexa Switch Installation). Alexa Switches can be used as on/off switches and as dimmer controls. The <<Control Switch>> will allow you to turn the thermostat off with a simple command such as <"Alexa, turn off Thermostat"> (assuming the Alexa Switch is named "Thermostat"). Please note that the "On" command will not turn on the thermostat; once you turn the thermostat off you will need to issue one of the mode commands to turn the thermostat back on (see Alexa Helper#Thermostat Mode Settings). Next, you will also need to choose a real thermostat to control, and whether you wish to have the thermostat controllable in Auto mode. This SmartApp has been tested with numerous community and SmartThings supported thermostats; however, not all thermostats have been tested and may not function with Alexa Helper. Since there is no feedback from the Amazon Echo on what you say outside of a verbal ‘Ok’, there are some protections you can set to ensure you don’t set the thermostat too high or too low. For example, if you say <”Alexa, set thermostat to 68”> and the Echo hears 58 instead, you could find the thermostat setting the incorrect temperature of the house, possibly engaging the air conditioning instead of the heater. To prevent this, input the upper and lower setting you would like Alexa Helper to send to the thermostat. Anything above or below these settings will be ignore and changed to the limits (if you say 85 and your limit is 75, the thermostat will receive 75). When the thermostat is placed into heating, cooling or auto modes the inputs in these sections will tell the thermostat the initial temperature to set for the various modes. Please note that auto mode sets a high and low limit, and unless the <<Control when thermostat in ‘Auto’ mode>> is tagged above, you will not be able to change the thermostat temperature. If you have turned on the <<Control when thermostat in ‘Auto’ mode>> switch, any temperature settings you command will set the high and low points of the thermostat. Please note that having a single setpoint in auto mode may not be desirable in some configurations as there would not be an 'buffer' between the heating and cooling settings. Please use <<Control when thermostat in ‘Auto’ mode>> at your own risk. If you want to change the heating, cooling or auto modes of the thermostat, you can use momentary button tiles to accomplish this. You can set up this type of switch as outlined in section Alexa_Helper#Momentary Button Tile Installation. If you are using a Nest thermostat, and you have enabled the <<Show Nest options>> on the main Alexa Helper <<Setting>> page, you will see two additional options that can be set up. Similarly to the mode settings outlined above, you can set up momentary button tiles to set the Nest thermostat to "Home" or "Away" mode. Please note that you may NOT send temperature commands to a Nest thermostat unless the device is in "Home" mode. It is highly recommended that you set the upper and lower limits of your thermostat. Alexa may misunderstand your temperature commands and cause physical damage to your home heating/cooling system. As the user you take full responsibility and liability for the use of this SmartApp and the Amazon Echo. Remember not to use the word ‘degrees’ at the end of your temperature commands. The Echo believes it is changing a dimmer switch using Alexa Helper, so adding ‘degrees’ to the end of the command will only confuse the voice recognition. Some thermostats (Like the Nest brand) can be set to "Home" and "Away" or this functionality is set automatically. Alexa Helper will only control the thermostat when the mode is set to "Home". If you have a thermostat that has these "Home" and "Away" functions and you would like to control them, be sure to enable the <<Show Nest options>> on the main Alexa Helper <<Options/Setting>> page. Just like the normal heating and cooling thermostats mentioned above, the Amazon Echo can control baseboard heating units individually or within a group (using the Echo app). 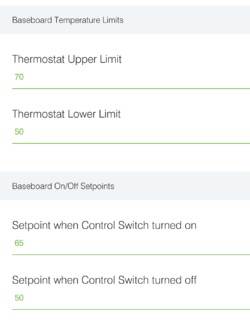 However, using a Baseboard Scenario, you can expand your control over the heating of your SmartThings connected baseboard heating unit. This includes allow you to set up consistent set points that set the temperature of a group of baseboard heaters without having to give a temperature number. To set up this baseboard control functionality, from the main Alexa Helper screen choose <<Create New Alexa Scenario…>>. You will be brought to the Scenario Name/Type screen. Enter a Scenario Name. When choosing the scenario type choose <<Baseboard Heater Control>>. Once chosen, click the field below the <<Scenario Type>> to enter the baseboard settings. At the top of the screen, choose a <<Control Switch>> to use as the baseboard control. It is recommended you use an Alexa Switch (see Alexa Helper#Alexa Switch Installation). Alexa Switches can be used as on/off switches and as dimmer controls. The <<Control Switch>> will allow you to turn the thermostat off with a simple command such as <"Alexa, turn off heating"> (assuming the Alexa Switch is named "Heating"). Next, you will also need to choose the baseboard heaters to control. Please note that you can choose multiple units in this section, however, all of them will be have the same settings applied to them when changing the control switch. If you require different rooms to have different settings, it is recommended to use multiple scenarios (You can, however, have the same heating trigger). This SmartApp has been tested with numerous community and SmartThings supported baseboard controls; however, not all units have been tested and may not function with Alexa Helper. As mentioned in the thermostat section above, there is no feedback from the Amazon Echo on what you say outside of a verbal ‘Ok’, there are some protections you can set to ensure you don’t set the baseboard setting don't get set too high or too low. For example, if you say <”Alexa, set heating to 68”> and the Echo hears 78 instead, you could find the baseboard heating the room to the incorrect temperature. To prevent this, input the upper and lower setting you would like Alexa Helper to send to the baseboard heaters. Anything above or below these settings will be ignore and changed to the limits (if you say 85 and your limit is 75, the thermostat will receive 75). To make operation of the baseboard heaters easy to manage, you can specify setpoints the baseboard heaters will be set to when the Control Switch is turned on or off. For example, if you set the on setpoint to 65, and the off setpoint to 50, when you issue the command <”Alexa, turn on Heating”> the baseboard will be set to 65. In contrast, when you say <”Alexa, turn off Heating”>, the baseboard will be set to 50 degrees. It is highly recommended that you set the upper and lower limits of your thermostat. Alexa may misunderstand your temperature commands and cause physical damage to your home heating system or allow the room to get too cold in the winger. As the user you take full responsibility and liability for the use of this SmartApp and the Amazon Echo. If you have a StelPro baseboard Z-Wave controller, additional logic is in the code to 'Apply' the change in temperature to the thermostat. This is a unique requirement of the StelPro units. All other baseboards that comply with SmartThings thermostat settings should also work fine. For connected Speakers, such as the Sonos brand, you can natively use your Echo to turn the speakers on or off if they are within your SmartThings account. However, there is no native control via the Echo to allow for volume control or changing tracks. Using Alexa Helper, an Alexa Switch and a couple of momentary button tiles you can gain this functionality. As you did with the prior scenarios, choose <<Create New Alexa Scenario...>> from the main screen. Enter the scenario name and choose the scenario type choose <<Speaker>>. Once chosen, click to the next screen enter the speaker settings. On this screen, choose <<Control Switch>> (usually an Alexa Switch) that you will use for not only volume control but to turn the speaker on or off. 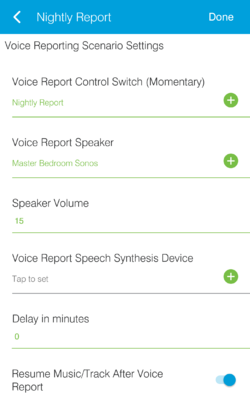 Next, choose a speaker enabled within SmartThings to control with this SmartApp. You will also want to ensure if you use this SmartApp to control your speaker that you remove the on/off capability from the Amazon Echo mobile application and include the Alexa Switch you will be using with this SmartApp instead. Similar to the thermostat temperature limits (Alexa Helper#Thermostat Temperature Limits), you can set up the upper and lower limits of the volume in case your Echo misunderstands your commands. You may also set up an initial volume whenever the speaker is turned on. 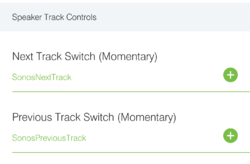 Using momentary button tiles, you may also set up a next track and previous track command. For example, if you have a momentary button tile named "SonosNextTrack" and "SonosPreviousTrack" you would simply say <”Alexa, turn on SonosNextTrack”> or <”Alexa, turn on SonosPreviousTrack”> to change tracks. In the area labeled <<Other Functions/Controls>>, you can choose switches to turn on or off in unison with the Control Switch. This is useful to set up other automations when the speaker is activated. In this section, you can also choose the action the speaker will take when you issue an "Off" command to the Control Switch. When the toggle is off, Alexa Helper will tell the speaker to pause the current song on the "Off" command. In the on position, it will stop the playback upon issuing the "Off" command. Please note you can only "pause" music tracks; internet radio stations don't pause as they are streaming music. If you have a Sonos speaker and have turned on the <<Show Sonos options>> on the Alexa Helper <<Settings>> page, you will be presented with a number of areas (number of slots is defined in the <<Settings>> page as well) to set up momentary button tiles to save specific songs or stations for easy switching via your voice. Simply choose the momentary button tile you want to use, then choose from a list of recently played songs or stations. 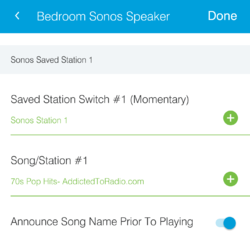 Using the example shown below, saying <"Alexa, turn on Sonos Station 1"> will play the station "70s Pop Hits-AddictedToRadio.com". Finally, you will also have the option of using text-to-speech to announce the name of the song or track prior to playing it. The Sonos integration within SmartThings is currently in listed as a "Labs" . 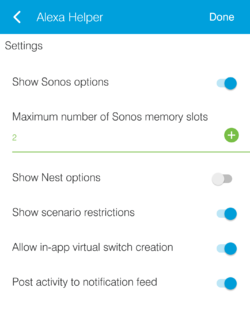 function a "Labs" or beta release until SmartThings releases a stable release of Sonos control. When you have completed configuring the settings of the speaker, tap <<Done>> at the top of the page. This will give you one more opportunity to change the scenario now or modify your restrictions. When you are completely satisfied with all of your settings within the scenario, click <<Done>> again to return to the Alexa Helper main interface. While the Amazon Echo does speak, there is currently no option to have it report back the status of SmartThings devices. For example, while you can ask for the temperature from the Echo, it will only report the local outdoor temperature according to the internet; having Echo read back the internal home temperature, or the status of connected locks or open/close sensors, is not currently supported. However, using a momentary switch, Alexa Helper can output the status of various SmartThings devices though a connected speaker, such as the Sonos brand. To set up this reporting, create a new scenario from the Alexa Helper main page, enter the name you would like to give it in the <<Scenario Name>> area, then tap <<Scenario Type>> and choose <<Voice Reporting Scenario>>. Finally, tap <<Voice Scenario Settings> when it appears to begin configuring the other aspects of the scenario. Just like the other scenarios above, you are first required to choose a control switch that will initiate the voice reporting. In this case, you will choose a single momentary button tile switch in the <<Voice Report Control Switch>> area. Next, you will choose a connected speaker or speech device to use for the voice reporting. As mentioned above, the output can not currently come from the Echo itself, so a SmartThings connected speaker or speech device is required. The Sonos integration within SmartThings is currently in listed as a "Labs"
Next, choose a volume for the reporting if you choose to output via a speaker. If no volume is defined, the last used volume of the speaker will be used, which may not be desirable. You may also choose to have the voice report speak after a delay, usually in the case of one automation calling another automation. If you require a delay, put the number of minutes of a delay you would like before the voice report sounds after the control switch is tripped. Finally, you if you typically have music playing when you run the report, you can choose to have the music resume when the report is over and you can choose to have the report push notification to the app or SMS to a mobile device. Once you have chosen the name, output device and volume, you may proceed to configure the reports that will be played when the Control Switch is triggered. Switch/Dimmer Report This report allows you to define switches or dimmers that will be reported on individually. There is also an option on this page to consolidate the reports, and have it only announce when the monitored switches or dimmers are on. Presence Report This report allows you to define presence sensors that will be reported on individually. There is also an option on this page to consolidate the reports, and have it only announce when the monitored sensors are 'not present'. Door/Window Report This report will allow you to get a consolidated report of the open windows, unlocked doors, or open sensors. Temperature/Thermostat Report As the name implies, this will report out specific temperatures from your SmartThings devices, or define a single device for the variable "%temp%". It will also allow you to check the setpoints of various thermostats. Mode and Smart Home Monitor Report This area gives you the option of speaking the current mode and Smart Home Monitor (SHM) status. In addition to these reports, you also have the option of entering some customized text that will be spoken before and after the main report. In the example above, this report was created to be played back at night, ensuring all doors and windows were closed and locked, wishing the user a good night's sleep. In this free text area you can add certain variables to give day, date and time the report is spoken. 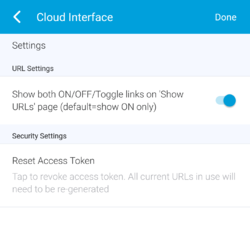 If your SmartThings set up includes two locations, or you need to generate unique URLs for your single location, the Cloud Interface SmartApp will allow you to do this. To install this SmartApp, go to your SmartThings mobile application and navigate to Market Place>>>SmartApps>>>+MyApps. This will bring up a list of SmartApps that you can install. Find the Cloud Interface SmartApp and tap on it. The application interface will appear. Using the SmartApp is easy. Simply tap <<Choose Switches>> on the main interface and select the switches you want to remotely control. Tap <<Done>> and below the switch selection area a new option appears to <<Show URLs>>. Tap this area and a screen will appear with the list of switches you have chosen and the unique URL for toggling these on and off (by default, only ON URLs are shown; to view ON, OFF and TOGGLE options you will need to toggle the switch on the <<Options>> page). Depending on your mobile device type, you can long-press on the URL needed, select all of the URL text and choose copy. You can then go to Alexa Helper and paste the URL in the appropriate area. it is best practice to only enable the switches you will actually be using. This prevents remote access to every switch should your access token be compromised. If you see an error on the URL page, you may not have enabled OAuth for Cloud Interface within the IDE. Go back to the IDE (http://ide.smartthings.com or https://graph-eu01-euwest1.api.smartthings.com depending on your country)) and follow the instructions to enable OAuth (see Alexa Helper#OAuth Setup). On the <<Settings>> page you will be able to determine the URLs that are shown on the <<Show URLs>> page and you will also be able to reset your OAuth. By default, only the ON URL will be shown on the <<Show URLs>> page. Toggle the slider to the right and the ON, OFF and TOGGLE options will appear. 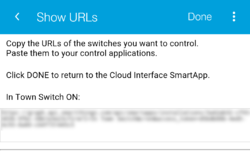 Open Cloud Interface SmartApp and find the <<Settings>> of the main interface. Tapping this will bring up the Settings page. Tapping <<Reset Access Token>> will generate a new Access Token. Tapping <<Done>> on this screen and on the previous screen will take you to the main interface page. Please note that any time you reset your access token you will need to copy/paste the URLs into Alexa Helper or any other location that you have used these links. The old links will no longer work. 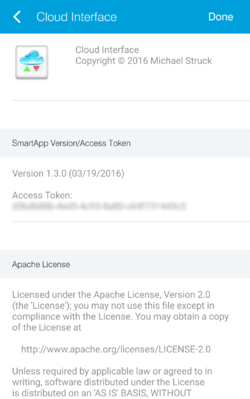 At any time you need to view your access token, or you need to determine the version number of the SmartApp you are using, tap on <<About Cloud Interface>> on the main page of the SmartApp. Again, if you see an error on this page regarding OAuth, ensure OAuth is enabled from the SmartThings IDE (see Alexa_Helper#OAuth_Setup). If you wish to remove Cloud Interface simply scroll to the bottom of the About page and tap the red <<Remove>> button. This will only remove the Cloud Interface SmartApp; it will not remove the main Alexa Helper SmartApp. Please note that if you do remove Cloud Interface you will no longer have remote access to the switches through the URL links. The following are tips and tricks you can use to get the most out of Alexa Helper. Using the Cloud Interface SmartApp, you can generate URLs that can simply be used in a web browser. Simple copy the links you obtain from the <<Show URLs>> page and create bookmarks to easily initiate switch on/off action right from your computer’s browser. The commands "Open" and "Close" appear to be an undocumented command set of the Amazon Echo. These commands initiate the on and off commands, respectively, of switches. Using this functionality you can use natural syntax to open or close a garage door. Using the scenarios restrictions, you can use a single voice command to have multiple outcomes. For example, let’s say you set a different mode on the weekdays than on the weekends when you go to bed. To accomplish this you could set up two scenarios, both using the same virtual switch named “Night Mode”; within the first scenario you restrict it to run Sunday through Thursday and sets a mode called "Alarm on", and the second only runs on Friday and Saturday and sets a mode called "Alarm off". Each night you could say "Alexa, turn on Night Mode". This would allow the same command to be issued nightly but behave differently depending on the day of the week. Please note that you must have the <<Show scenario restrictions>> turned on via the main Alexa Helper page under the <<Option/Settings>> area to see and use the scenario restriction. In the morning a program such as Talking Alarm Clock could key off of the Alarm on/Alarm off modes and react accordingly. Michael has two houses, one in Washington and one is Oregon. The Washington house has a water heater connected to a SmartThings switch, along with a handful of lights and locks. In the Oregon house, Michael has Nest Thermostat and lights and locks. Each house’s SmartThings account has a virtual switch (on/off) named “In Town”. This switch is “on” in whichever location Michael is present, and off in the opposite location. In addition, there is a momentary button tile in each location called “Out of town mode”. An “Out of town” routine occurs, turning off all of the lights (including the “In Town switch”), the water heater, locking the door and setting the security mode to “Armed:Away”. In addition, an HTTP URL is sent via Alexa Helper to the Oregon House turning the “In town” virtual switch on. In the Oregon home, the activation of the “In Town” switch also activates the thermostat, setting the proper temperature and turn the alarm off. When Michael leaves Oregon to go back to Washington, he says the same <“Alexa, turn on Out of Town mode”> command to the Echo in Oregon, and the process reverses, turning the “In Town” switch in Oregon off, turning the “In Town” switch in Washington on (via the URL generated by Cloud Interface), which runs a routine to prep the Washington house for arrival. While the name implies that Alexa Helper is just used with the Amazon Echo, there are other applications that can be used where you need to trigger a routine from a virtual switch. For example, let's say you have an event in your Google Calendar that you want to trip a routine. Currently, IFTTT only allows for certain devices to be triggered. Using Alexa Helper, you could create a scenario where a virtual switch is triggered by IFTTT and then changes a mode, security state, or runs a routine. To help remember the commands to give to your Echo, you may want to name your scenario the command you can use to activate a scenario. For example, if you have a scenario that turns off the lights using a virtual switch called "Night Mode", you may want to name your scenario "Turn On Night Mode", or simply "Night Mode". The following are common troubleshooting steps when working with Alexa Helper. When the application does not operate correctly or as you would expect, please check http://status.smartthings.com/ to ensure the SmartThings environment is working properly. If the SmartApp suddenly stops working, most of the time it is because of an outage or degraded service with SmartThings' cloud environment. While it is expected that you can upgrade to new versions seamlessly, there are situations where internal variables within the code changes or an old scenario conflicts with new code revisions. If you upgrade and find the application no longer performs as expected, it is recommended that you remove the application completely and start from scratch with new code. If you are unable to control your virtual switches, you may not have "discovered" them. Follow the steps in Alexa_Helper#Set_up_of_your_Amazon_Echo for the basic instructions for discovering your devices, or refer to the documentation that came with your Echo. If you find that your URLs are not triggering remote location, and you have verified placing the URL is working within a browser to control the device, SmartThings may be limiting the use of the direct URL from Alexa Helper. It is recommended you use a URL shortening service (like goo.gl) which creates a more manageable length URL and does not seem to be filtered by SmartThings. If Alexa Helper runs properly, but you get an error creating or editing a scenario, ensure the scenario (child app) is installed properly, saved, but NOT published. See Alexa_Helper#Alexa_Helper-Scenario_Code_Installation for proper installation of this child SmartApp. If this error occurs upon the first installation of Alexa Helper you may be encountering a SmartThings mobile application bug. This seems to occur mostly on Android installations (SmartThings mobile app 2.07). To prevent this from occurring, when you first open Alexa Helper immediately click <<Done>> in the upper-right corner of the page. Then, reenter the SmartApp. This note will be removed when SmartThings fixes this issue. 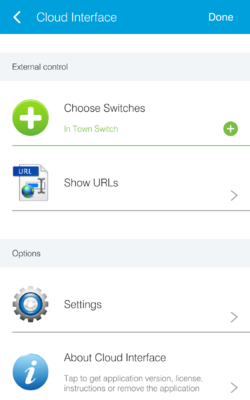 If you find that the Echo does not recognize the on or off commands of a specific switch, first start by testing the scenario operation by going to the switch control in the SmartThings mobile application (My Home>>>SwitchName) and toggling the switch manually. If you find that the switch does activate the scenario properly, then you may have an issue with the switch name. Cerrtain key words on the Amazon Echo are reserved and may not function if part of the switch name. For example, <”Alexa, turn on Good Night”> will not work, or <“Alexa, turn on Going out of town”>. In these situations, it is sometimes better to name the virtual switch something unique like “Night Mode” or “Out of town mode”. To resolve this, use you SmartThings mobile app (My Home>>>SwitchName>>>Edit Device (upper-right corner of screen)), or the IDE to rename the switch. If you receive an error when attempting to create a Control routine, please be sure your routines do not have commas, exclamation points, or apostrophes in them. In addition, ensure you have not inadvertently created a 'null' routine...this is a routine you may have attempted to create but abandoned. These will show up in your SmartThings IDE under you Installed SmartApps. If this happens, simply delete the routine via the IDE. Simply tap <<Edit>> in the upper left corner and the <<Update>> commands will turn into <<Delete>>. Please note that these are only proposed updates...There is currently no timeline to implement these, or any guarantee that they will be implemented at all. This page was last edited on 16 September 2017, at 13:51.